On October 18th, millions of people will participate in the Great Central U.S. ShakeOut, the region's largest earthquake drill ever! All colleges and universities are encouraged to participate in the drill. 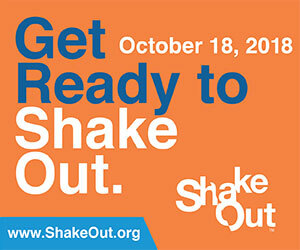 The UT Martin campus has been registered as a participant in this year’s ShakeOut. Major earthquakes may happen anywhere you live, work, or travel. The ShakeOut is our chance to learn how to protect ourselves, practice what we have learned, and for everyone to become prepared. The goal is to prevent a major earthquake from becoming a catastrophe for you, the UT Martin campus, and the Martin community. To participate in the UT Martin ShakeOut, rather than disrupting a classroom or office to perform the Drop, Cover, and Hold On drill, simply go to the following links and read the earthquake preparedness information at your convenience so that you will know what actions to take during and after an earthquake. Read about the dangers of earthquakes and how to protect yourself. And be sure you are familiar with the UT Martin Alert for an earthquake as well as the other Alerts. It could save your life.